My husband, Al, drove one of the very first minivans ever made. It was a gift from my father. It was old and drafty, but it ran. It was the first of September and winter was fast approaching. He decided he didn't want to spend another winter driving that freezing van, so we went out looking for a winter beater. In our search, we happened across a Harley dealership. Al had sold his ?84 Lowrider back in '99 for the down payment on our house, and he likes to stop and look at the bikes every now and then. Me, I could of cared less about looking at bikes until I came across the most beautiful bike I had ever seen. It was a '06 CVO Screamin' Eagle V-rod with so much chrome it sparkled! Needless to say, that was the end of our winter beater search, as he brought the V-rod home the next day. We rode his V-rod every chance we got until the day he wanted to play around on it and I didn't. He then suggested that I get my own bike so that we could ride side by side together. I liked that idea, all though I was nervous, as I had never driven a motorcycle. I signed up for the Riders Edge course, had my license in a weekend, and now needed to get my own bike. I had ridden a Buell Blast in the course and thought about purchasing one, but the instructor of the class explained that many women would buy one for learning on, but would upgrade within a year. I knew that I wanted a Harley, so I decided to find myself a Sportster. I figured that an 883 would be a great bike to start with. We started going to different Harley shops and I would check out the 883's while Al looked at everything else. One day he told me that I had to check out the CVO they had on display up front. It was love at first sight! It was the '08 cobalt and midnight blue FXDSE2 Screamin' Eagle Dyna. What a beauty, all chromed out, but what a price tag. It also looked huge to me. I vowed that someday I would own one. To make a long story short...after a couple of weeks searching, I still had not found the bike that screamed to me. Al was getting frustrated with me and said, "Get the bike that you want now, 'cause if you don't, you'll regret it next year when you want something bigger." I thought about it a couple of days, and then called the dealer where the FXDSE2 was. It was still there! I made a deposit over the phone and picked her up the next day. I spent three weeks practicing on her in a large empty parking lot. Al then took me on short trips on the back roads. When he thought I was confident enough, I started riding with the group of people we hang with. They were awesome! They started me with short trips, with frequent stops. They would all give me tip and pointers on riding, and the best part was all the positive encouragement I received from them. I have been riding now for three years. 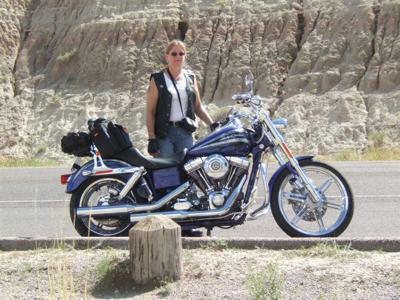 I have ridden my bike at Sturgis (where I dropped my bike for the first time right on Main St. and you wouldn't believe all the help that came to help me pick it up!). I rode to TN and NC this summer and did the Dragon. That was so awesome! The best part is I have the bike that I want, and I have the support of a loving husband and an awesome group of friends. What more could a woman want, except maybe some nice, warm, sunny weather to go for a scoot. Sounds like you have just about everything!! Nice story. Thanks for sharing.